A vegetable dish that has actually been requested, I repeat VEGETABLES REQUESTED by my husband! My husband will eat veggies, but he definitely doesn’t request vegetables. Plus both my boys (4 yrs. and 11 mo.) both sat and munched green beans too. Actually my boys were really cute while I was making this. My four year old sat on the counter and stole blanched green beans that hadn’t been dressed yet out of the bowl, and slipped them to his little brother too. You really can’t get mad at your kids for stealing green beans. And best of all.., it’s so easy to make it doesn’t require a ‘real recipe.’ Drum roll… Here it is. Blanch your green beans. 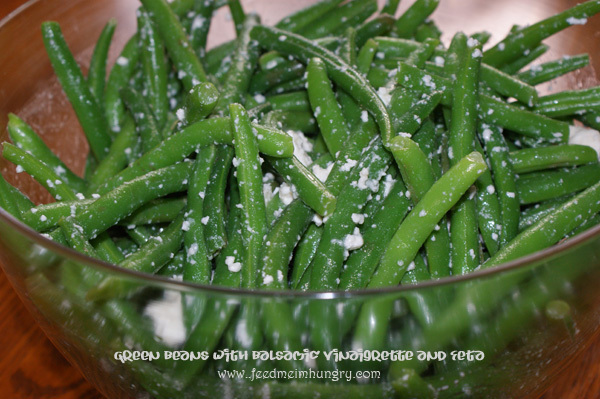 If you’ve never blanched green beans don’t worry it’s super easy, check out this article. Mix together equal parts extra virgin olive oil and a sweeter balsamic vinegar. Mix enough to lightly coat your green beans. Crumble feta over the green beans. Fresh herbs of pretty much any sort work wonderfully in this as well. My favorite as you can probably guess if you’ve been reading for a while is fresh basil, oh yum. Give it a try and let me know if your kids eat it too. I’m kind of curious if green beans are a kid thing or if mine are odd balls on this one.